Today in the forex trading The Forex Heatmap® signal system gave a buy signal on the GBP/JPY. 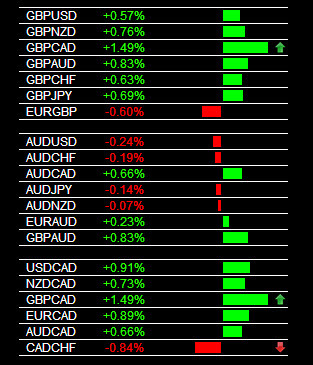 You an check the heatmap below, and it shows that the Japanese Yen (JPY) was weak on all pairs, which drove these pairs up. 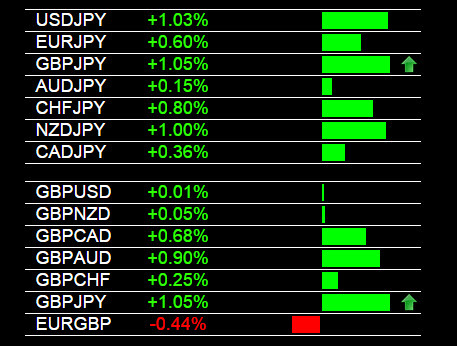 The British Pound (GBP) was mostly strong and this pushed the GBP/JPY strong movement to the upside. This pair is in a long term uptrend, so it could easily continue up to the 189.50 resistance area from here, so we consider this to be a hold. The signal system you see below is The Forex Heatmap®, which gives live buy and sell signals for 28 currency pairs. Today in forex trading the British Pound (GBP) strength was seen on all pairs in the group. The GBP strength caused strong price movement on this group of pairs. The GBP/NZD had a good movement cycle to the upside, this pair should continue much higher as it is trending up with no nearby resistance. The GBP/AUD also had a strong upward movement, but this pair is at one resistance point so we would be scaling out lots and taking some profits. The live visual alert system you see below is The Forex Heatmap®, our real time visual trade alert system. Today the retail sales news from the British Pound (GBP) was announced. After the news the GBP strengthened on all pairs. Month over month sales volume was up 2.6% vs 0.5% forecast, and this drove the GBP higher. For traders, these pairs moved up quickly after the news was announced. Pairs like the GBP/AUD moved strong to the upside. This pair is nearing a breakout point and we will look to set buy plans on some of these pairs next week at their respective resistance breakout points. After any news driver you can use The Forex Heatmap®, which is shown below, to enter forex trades across 28 currency pairs. It works under most market conditions, or after news for 8 currencies.